Under metabolically controlled conditions, consumption of plant sterols, soy protein, viscous fibers, and nuts is associated with a reduction in serum cholesterol levels. To assess the longer-term cholesterol-lowering effects of a diet emphasizing consumption of these foods in combination (the “dietary portfolio”), Jenkins and colleagues randomly assigned 345 adults with hyperlipidemia to receive advice on the dietary portfolio or advice to consume a low–saturated fat therapeutic diet (control). The authors report that compared with the low-fat diet, use of the dietary portfolio was associated with larger reductions in low-density lipoprotein cholesterol levels over 6 months' follow-up. Patients are vulnerable to medication-related errors during care transitions. Bell and colleagues Article analyzed hospitalization and outpatient prescription records from nearly 400 000 patients aged 66 years or older in Ontario, Canada, and found that hospitalization was associated with an increased risk of potentially unintentional discontinuation of commonly prescribed chronic disease medications in the 3 months after hospital discharge. In an editorial, Khan and Angus Article discuss the potential for prescription errors and opportunities for improvement across medical care transitions. Automated text search tools—such as natural language processing—applied to electronic medical records (EMRs) may offer an alternative to administrative data surveillance to identify patient safety concerns. 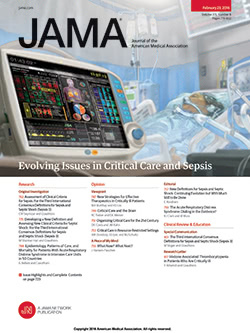 In a cross-sectional study that involved 2974 randomly selected patients undergoing inpatient surgical procedures at 6 Veterans Affairs hospitals, Murff and colleagues Article found that natural language processing analysis of EMRs performed better than patient safety indicators—a commonly used administrative-code–based algorithm—in identifying postoperative complications. In an editorial, Jha Article discusses potential capabilities of electronic health records for transforming health care. In a population-based cohort of 1402 persons aged 45 years or older at baseline, Kane and colleagues assessed longitudinal changes in diastolic function and the incidence of heart failure. The authors report that during 4 years of follow-up, the prevalence of diastolic dysfunction increased and progression was documented among 23% of participants. Diastolic dysfunction was an independent predictor of heart failure during an additional 6 years of follow-up. Some preliminary data have suggested an association between biologic therapies for chronic plaque psoriasis and major cardiovascular events. To further assess this relationship, Ryan and colleagues performed a systematic review and meta-analysis of data from 22 randomized placebo-controlled trials (comprising 10 183 patients) of anti–interleukin (IL)-12 and IL-23 agents and anti–tumor necrosis factor α agents for treatment of chronic plaque psoriasis. Compared with placebo, the authors found no significant increased risk of major cardiovascular events associated with these agents. However, they acknowledge the clinical trials analyzed may have been underpowered and of too-short duration to detect rare and long-term cardiovascular events. More oversight of the US drug supply is needed as a shift in production of pharmaceuticals to the developing world has increased risks of substandard and counterfeit medications. Join Laura Mosqueda, MD, Wednesday, September 21, from 2 to 3 PM eastern time to discuss identification of and intervention for elder mistreatment. To register, go to http://www.ihi.org/authorintheroom. Mr J is a 76-year-old with multiple medical problems and limited health literacy. How would you reduce the complexity of his medical care and help him understand his self-care needs? Read the case at www.jama.com. Submit your response by September 14 for possible online posting. For your patients: Information about psoriasis. This article was corrected for errors on August 23, 2011.